Park West offers flexible payment terms, whether you want to make a downpayment for bigger discount or deferred financing for lower payment. All unit options (1- and 2-Bedroom units) are still available at Park West. Units are selling fast as both homeowner and investor are attracted to the value of unit and favorable financing schemes. Let me know if you want a copy of the Availability Chart to pick your preferred unit. Below are sample computations of different unit options (1- and 2-bedroom) at Park West. 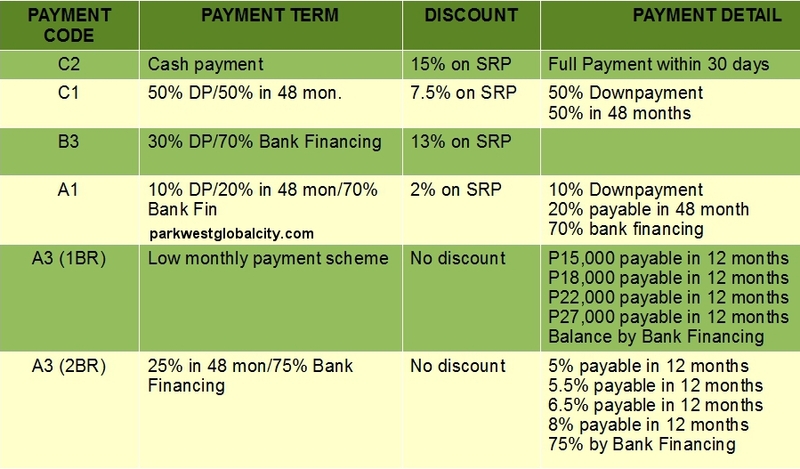 Price of actual available unit maybe different from these sample computations as unit price depends on the view (Global City, Ortigas or Makati skyline view) and unit location (low or higher floors). 1-Bedroom with 36 sq.m. Unit 7K is a 1-bedroom priced at P3,559,766 (before discount) and comes with 36 sq.m. with a Northern exposure and view of 36th Street/Kalayaan Avenue/Ortigas. This 1-bedroom unit includes a master bedroom, a bathroom, kitchen, dining area, living room and balcony. For sample computation click: Unit 7K with 36 sq.m. 2-bedroom with 55 sq.m. Unit 7D is a 2-bedroom unit with 55 sq.m and is priced at P5,829,200 (before discount). Unit 7D has Southern exposure with dual view of amenity and Global City view and 7th Avenue/Grand Hyatt in the East. This 2-bedroom unit comes with Master bedroom with its own mater bathroom, a second bedroom, a bathroom, kitchen, dining and living areas and balcony. For sample computation click: Unit 7D with 55 sq.m. 2-bedroom with 70 sq.m. Unit 7E comes with spacious 70 sq.m. situated in the East side of the Park West with dual view of 7th Avenue/Grand Hyatt and a view 36th Street/Kalayaan Avenue/Ortigas view on the North. Unit 7E is priced at P7,378,360 (before discount) It includes a master bedroom with its own master bath, a second bedroom, a bathroom, kitchen, dining, living area and balcony. For sample computation click: Unit 7E with 70 sq.m. Units included in sample computation are subject to availability. Price list and payment terms are subject to change without prior notice. The above computations are based on Price list no. 1 dated July 17, 2011.